Hello Everyone! We all have heard of high profile laptop distribution scheme of Samajwadi government (2012-2017) lead by Akhilesh Mulayam singh Yadav. But after finishing of the government tenure, and as the next Chief minister of Uttar Pradesh, Yogi Adityanath took the charge, an RTI has revealed that there is scam of crores in “Samajwadi laptop distribution scheme”. Below is some of the information about this scam, do check out. 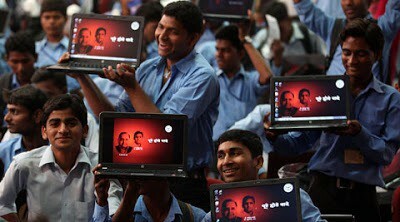 Class 12th pass students enjoying after got the laptops distribute by Uttar Pradesh Government today. Uttar Pradesh Chief Minister Akhilesh Yadav start free Laptop distribution scheme for State. on Monday. Express Photo by Vishal Srivastav. 11.03.13. Laptop distribution was one of the most important scheme of Akhilesh yadav government, and very well marketed during campaign of 2012 Uttar Pradesh assembly election. Many youth were attracted towards this scheme and Samajwadi party specially made one web portal where students are asked to fill their information, in case of getting benefits of this scheme. But below is some information, which will shock you, revealed by an RTI. Readers must check out Laptop scam by AKhilesh Yadav. Government lead by Akhilesh yadav had bought 15 lac new laptops and only distributed 6 lac laptops. RTI or government office does not have any information regarding where the 9 Lac (15-6) laptop gone. Total Laptop bought by Akhilesh yadav government: – 14, 81,118. Just ahead of new government formation in UP, (before BJP govt), government of UP has bought 71,875 new laptops at the rate of Rs.13, 490/-. Total Laptop Distributed between 2012-2017:- 6, 11,000/-. In agra, Government has bought 38,615 laptops and distributed 16,638 only. Allahabad, 69,395 laptops bought and distributed only 20,341. Ambedkarnagar :- 40,177 laptops were bought and only 7,218 laptops were distributed. In Varanasi, only 15,410 laptops were distributed while it shows govt had bought 28k new laptops. Kannauj :- 5605 laptops were distributed, 13k laptops were bought. In etawah, 13k laptops were bought and only 10k laptops were distributed. SP Govt has put Smajwadi party sticker on laptops and on laptop bags, which was clear violation of SC guideline. In 2014, When SP government lose the election badly, Ex-SP Chief Mulayam singh yadav had said that distribution of Laptops, promotion of english language is the reason for big defeat of SP in the state. In the June, 2014, when akhilesh yadav government has presented budget, they had shut down this laptop distribution scheme with reason of “NO FUND”. So, by the time when scam was happened, SP government has already started erasing the signs of scams. This RTI were filed by Shantun Gupta, he has complained about this laptop scam to current CM Yogi Aditynath. CM Yogi has ordered inquiry in this scam, We will update you with more information on this scam. Since last few months (before the 2017 assembly election), The website which was used for laptop distribution name was shut down too. No information were public and no access been given to data of laptop scheme. It is also comes to know that to hide the signs, SP govt had taken back laptops from many students. So, if we calculate that fact that If one laptop bought at Rs.13,490/-, and 9 lac laptops are missing, which counts as Rs.12,69,67,74,510/- only. Total Scam of Rs.12,69,67,74,510/- by Akhilesh Yadav Government in laptop distribution.